“What color should we make your super suit?” asks the artist. Seated in the shade of a large oak tree next to the playground of Franciscan Children’s—a leading pediatric rehabilitation center in Brighton—a local comic book artist named Jason Wiser sits with 11-year-old patient Massimo Reveliotty and listens as Massimo’s imagination runs wild. As Jason adds some final shading to his pencil sketch, Massimo looks on, enamored at the portrait unfolding on the page in front of him. 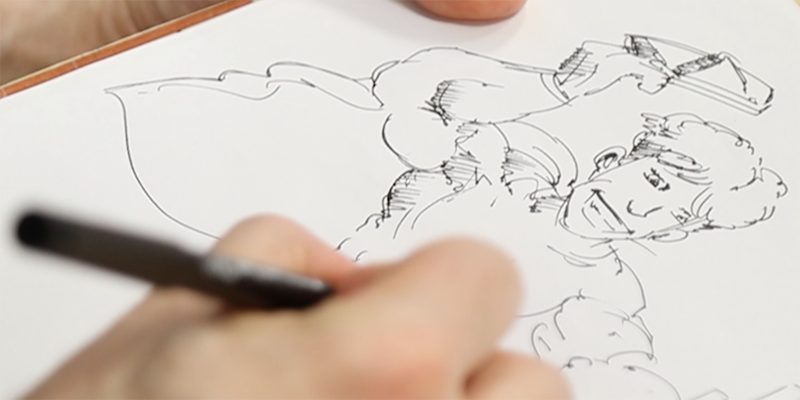 As it begins to take shape, from the swaying cape to the bulging muscles to the chiseled facial features, it dawns on Massimo what Jason is drawing: A portrait of a superhero that looks just like him. Every kid believes they have a superhero inside them, either one straight from a comic book or one dreamed up in their own imagination. The special powers, bright costumes, and passion for justice let children live out their dreams of saving the day. 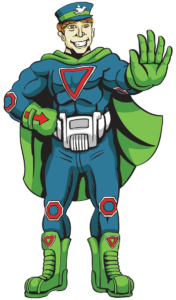 But for some kids, being a superhero is about more than playing the hero; it’s about facing, and overcoming, the challenges ahead of them and never giving up. Massimo and his mother, Angela, shortly after his birth. On April 29, 2006, Massimo Reveliotty was born three months premature, weighing less than two pounds. Even though children born this early have a 90 percent chance of survival, immediate complications put Massimo’s health in jeopardy from the start. To help him breathe, doctors performed a tracheotomy. To help him eat, doctors inserted a gastronomy tube. In all, Massimo underwent two dozen procedures during the first two years of his life. However, during one of these surgeries, Massimo went into cardiac arrest, which caused sustained hypoxia—or lack of oxygen—leading to cardiovascular and neurological issues. Because her son was born so early, Massimo’s mother, Angela, had not yet picked out his name. She searched to find one that would suit her son, who was already up against such great odds. Her family in Italy jokingly suggested names of Roman emperors, like Augustus and Caracalla. But among their suggestions was one that actually suited her little boy perfectly: Massimo. Massimo at three months old at Boston Children’s Hospital. From the beginning, Massimo was a fighter. After he was born, he spent four months in the neonatal ICU. When his condition worsened, he was transferred to Boston Children’s, where doctors fought to save his life. Finally, Massimo’s condition was no longer life threatening, but he was by no means ready to go home. 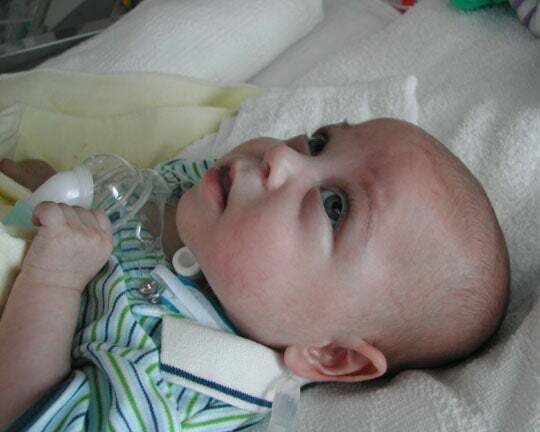 Once stabilized, he was transferred to the Inpatient Pulmonary Rehabilitation Program at Franciscan Children’s. 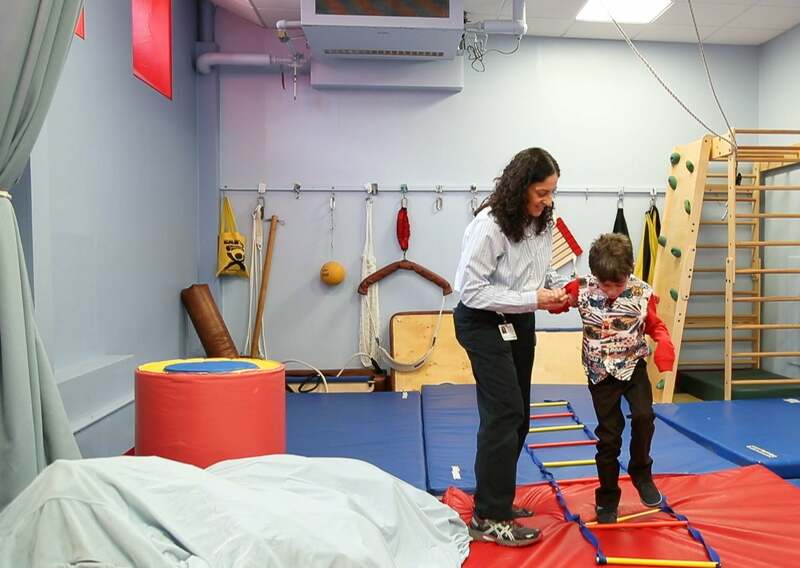 The family-like environment at Franciscan is uniquely designed to care for children precisely like Massimo, whose long-term and complex medical needs require months and even years of care, as well as children who only require a few weeks of rehabilitation and therapies. “Franciscan’s focus wasn’t only on Massimo, but also on us as parents. They prepared us to properly and safely care for a child with so many complications,” says Alex. 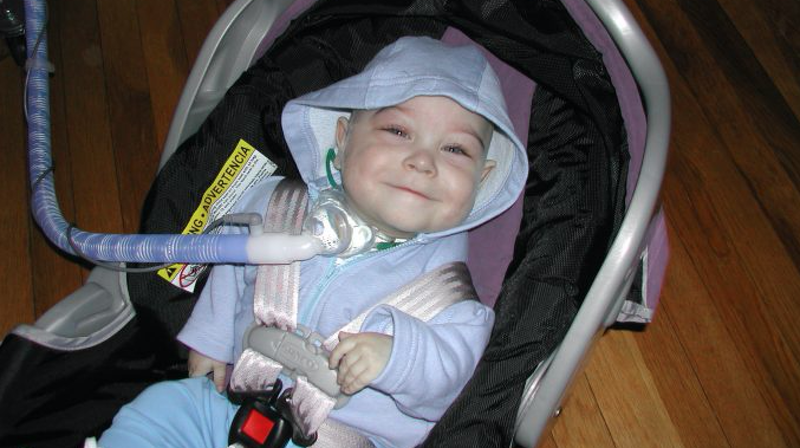 Massimo had chronic lung problems, vocal cord paralysis, and motor and feeding disabilities. But over a period of months, Massimo received attention in a program aimed at helping children with pulmonary issues gain more independence. Slowly, he built strength and grew more and more healthy by the day. 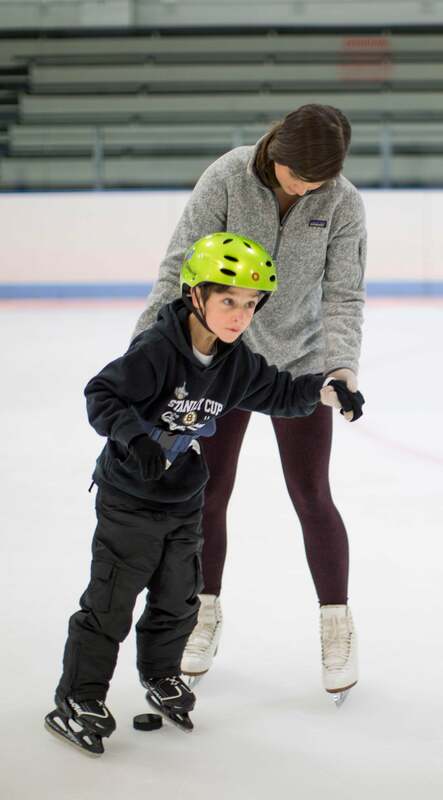 On February 12, 2007, after spending six months at Franciscan Children’s, Massimo left the hospital and went home to Watertown for the first time. Massimo at age one, ready to go home. Massimo on the ice during one of his skating practice sessions. 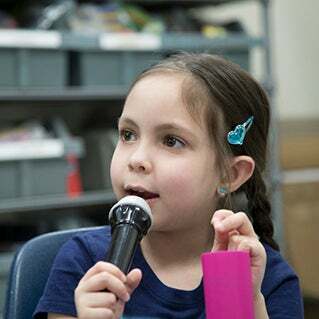 When Massimo was a newborn, doctors said he would most likely need a wheelchair, would be technology-dependent, be unable to speak, and never go to public school. Those doctors may have known medicine, but they didn’t know Massimo. Over a decade of persistence and steady progress at Franciscan Children’s, Massimo has grown into an energetic, outgoing boy; one who not only walks, but rides a bike wearing a spiked-mohawk helmet; who not only talks, but tells silly jokes; and who not only goes to public school, but attends full time as a flourishing fifth grader. When they first came to Franciscan Children’s, Massimo’s family realized just how different it was. The staff of doctors, nurses, and therapists promised to take care of Massimo, and over the years helped him reach his full potential. Massimo still goes to Franciscan Children’s for primary care, speech therapy, physical therapy, and behavioral health services. Today, he is in the middle of a physical therapy session with his physical therapist, and longtime friend, Maria Fragala-Pinkham. Massimo during a physical therapy session with his therapist, Maria. Not too far away, seated on a small chair and sketching in a thick notebook, sits Jason Wiser, cartoonist, creative director, and adjunct professor of game development at Harvard University. Studying Massimo’s facial features and body language, Jason draws a quick draft of what he could look like as a character in a comic book. Then he shows his drawing to Massimo’s parents and asks them about their son. Inspired, Jason gets back to work on a more detailed sketch of Massimo. 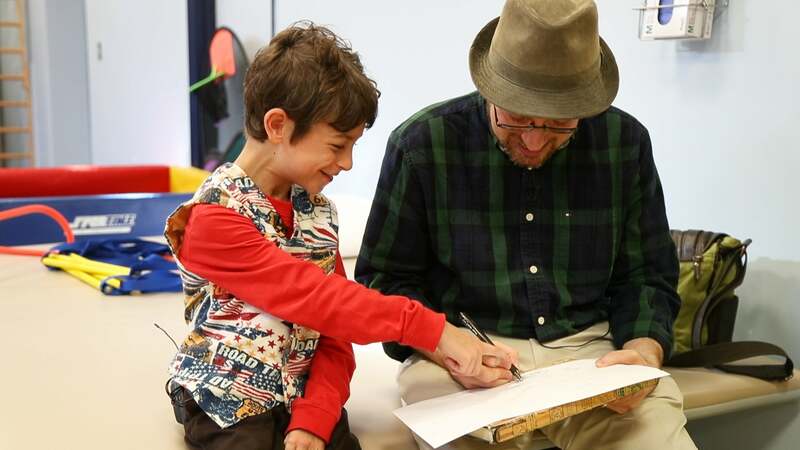 After ten minutes of drawing, Jason presents his rough work to Massimo, who has earned a break after jumping, climbing, and balancing in physical therapy. “Yes,” Massimo answers with a smile. 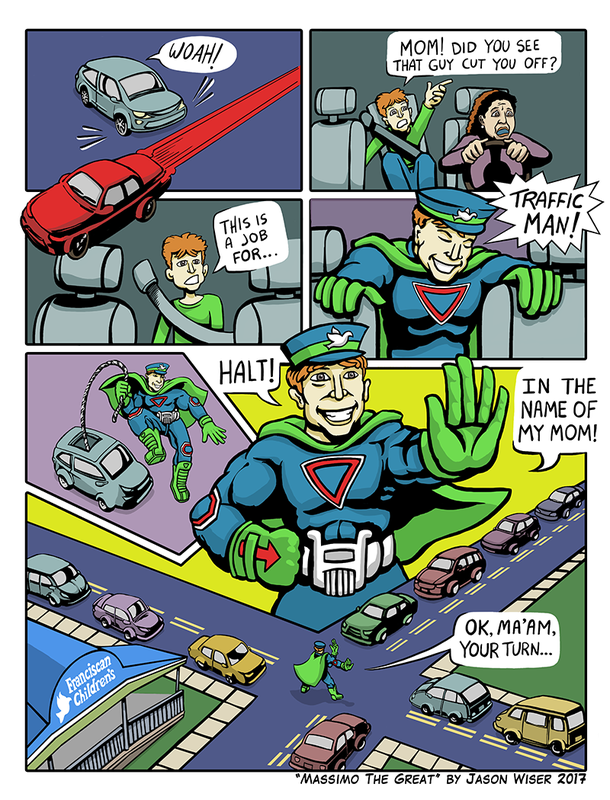 For a few more minutes at Franciscan Children’s, Massimo and Jason talk about Traffic Man’s costume and abilities. The look on Massimo’s face as the artist at his side brings his superhero character to life is nothing short of mesmerized. In real life, flowing capes and big muscles symbolize heroism. But heroism is more than that. Being a hero takes courage. The courage to do something unexpected, to face a big challenge, and sometimes, courage to have the will to succeed in the face of great odds. 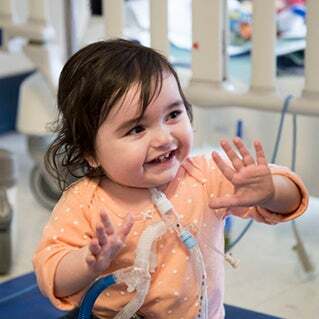 To learn more about children like Massimo and the services that Franciscan Children’s provides, please visit franciscanchildrens.org. 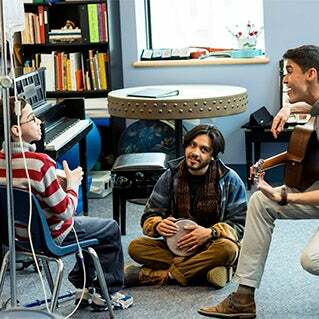 At Franciscan Children’s, where complex medical conditions are routine, the day always seems brighter when the instruments come out and, for kids like Kevin, songs become therapy.